Today, when you order "Experience: The Magic of Jon Allen by John Lovick ", you'll instantly be emailed a Penguin Magic gift certificate. You can spend it on anything you like at Penguin, just like cash. Just complete your order as normal, and within seconds you'll get an email with your gift certificate. "Stunning effects and jaw-dropping magic!" "Jon Allen's magic is so strong and yet so offbeat. And what sets this collection apart is the amount of parlor material he includes. 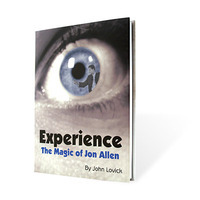 Anyone working on their close-up or stand-up acts would benefit greatly from Experience: The Magic of Jon Allen." 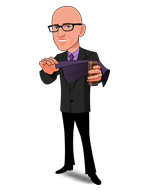 Jon Allen is a man of many talents: he is a first place winner in close-up magic at both the International Brotherhood of Magicians and The Magic Circle. He is also the creator of "The Silent Treatment," one of the best-selling and most innovative stand-up magic effects marketed in the last decade. And he is one of the busiest magicians in the United Kingdom. For the first time ever, Jon Allen is tipping his most prized routines, and ideas-fifty effects packed into more than 200 pages of polished, performance-ready magic. More than 400 photos are included to make your learning experience a pleasurable one. Written with the inimitable style and wit of John Lovick, this important book will challenge and delight any lover of magic. Jon's full Competition Act: including a solid two-foot cigarette from jacket and the show-stopping borrowed ring in sealed party popper. Freddy's Dead: Jon's devastating version of Professor's Nightmare brings many new developments to this classic plot; suitable for close-up or stand-up. Schrödinger's Card: Jon's controversial card effect that leaves participants with an impossible object and a memory they will never forget. And dozens more! You'll learn five stand-up effects, suitable for large crowds and even theater work-all of which pack in your pockets. "This book is the work of a man who thinks. Like many, Jon Allen thinks about method (and the results can be insidious)... but unlike many he also, blessedly, thinks of more than method. Turing a page of this book is like opening a present on Christmas day. And I say this as a Jew." "There is a marvelous elegance and economy to Jon's work as a performer and as a creator. Experience does an extremely good job of capturing both!"